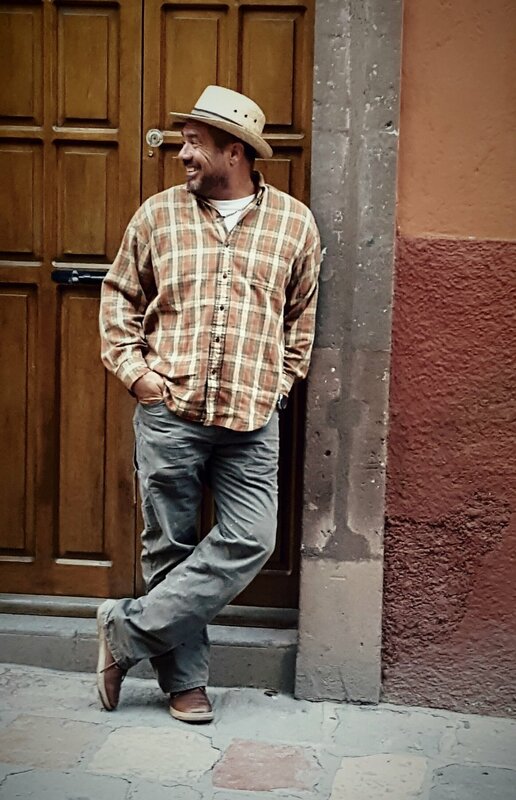 Photo taken at San Miguel de Allende Mercado. Of all the things we have for this trip….we both agree that the best thing is the “Red Mosquito” motorcycle we bought in Puerto Vallarta. It’s a little Italika 115 that we picked up brand new for less than $800 US dollars. The truck is big and uses a lot of gas. We can go far and fast on the Mosquito, and it costs us less than $5 a week for gas. We take that motorcycle everywhere, and it is much more fun. We use the truck almost exclusively as transportation from one destination to the next, and the Mosquito and bicycles otherwise. We have a cart for PJ that attaches to both the Mosquito and the bikes, so he can come with us. Jorge also added a plastic crate on the back of the Mosquito so we can use it for grocery shopping or to do laundry. We have our rhythm now on this road trip. Things are getting easier and we have various systems in place when we are on the move. Things aren’t as complicated as I thought they might be. As we prepared for the trip we weren’t exactly sure how we would work with money. Should we have a sum of money hidden in the truck or the trailer? How much cash should we carry? Turns out to be very simple. Most ATM’s allow you to withdraw 5000 pesos (roughly $260 US dollars) at a time. It works for us to withdraw 5000 pesos each, every 10-14 days. I usually put half of that in a secret place and carry the rest. I think Jorge carries the full amount with him. We don’t need much. We haven’t used credit cards, just cash from the ATM. In Central Mexico a meal at a restaurant or food stand has cost us about $3 US dollars per person. Many of the "restaurants" are actually someone's house. 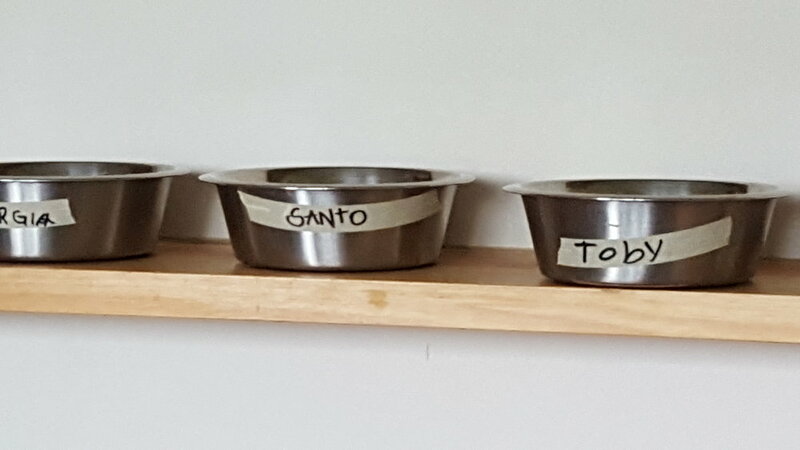 They open up their kitchen, maybe add an extra table or two. Some cook in front of you, and others have a few pots of homemade food on the table, and you just serve what you want. The other day at the market we bought 6 tomatoes, 3 onions, 8 limes, and a handful of jalapeños for under $1 US dollar. At the same market I got three healthy bean tostadas - with lettuce, tomato, onion, cheese and salsa for about .50 cents TOTAL for all three! 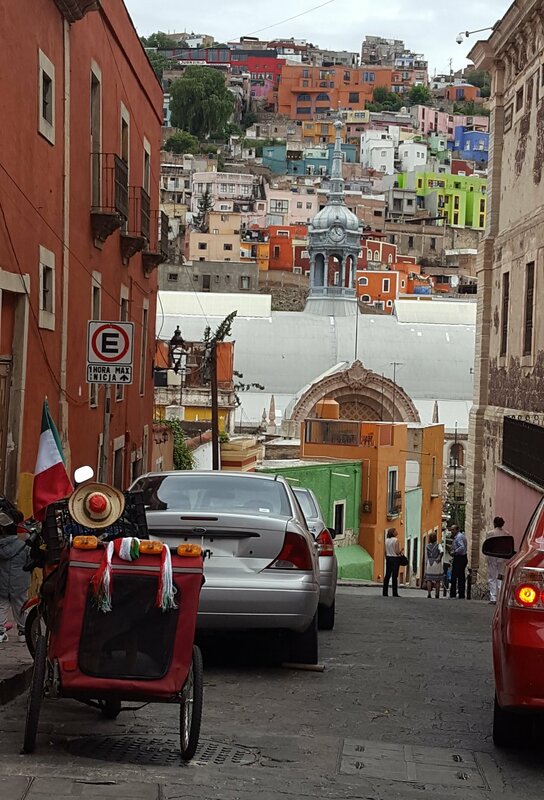 Photo of Guanajuato (left), San Miguel de Allende (right). I was really looking forward to finally seeing Guanajuato and San Miguel de Allende. 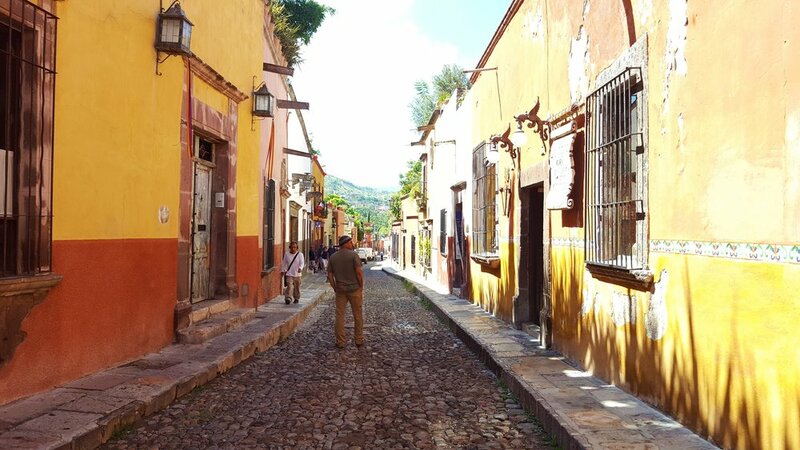 We planned on staying in Guanajuato the usual two weeks, and taking a side trip to San Miguel during that time. We got up early to start the 5+ hour drive from Guadalajara. About a half hour into the trip we stopped at Pemex for gas, and Jorge noticed we had a broken lift spring on the trailer. Jorge decided to just pull it over to the side of the Pemex and weld it right there. I ran across the highway to one of the food stands and bought some chicken, tortillas and drinks. He finished in 45 minutes; we had lunch, and were back on the road in an hour. We were pretty impressed with ourselves. Jorge welding the lift spring on trailer. There were two RV parks in Guanajuato, and I thought one was too small for our 5th wheel. So we choose Bugamville RV Park. For the first time, we were a little disappointed in the park. It was very “blah”. It consisted of a fenced-in, big open grassy field, an office, restrooms, restaurant and small playground on one end. No trees. No personality. More importantly, the whole place looked closed. After about five minutes a teenage boy appeared and opened the gate and let us in. The park turned out to be just fine. PJ had a whole field to run free. It cost us $14/day. We were out exploring most of the time anyway. The morning after we arrived we left PJ at the trailer and jumped on the Mosquito to check out Guanajuato. I had seen photos, and heard it was one of the most beautiful cities in Mexico. After spending two weeks there, I will say it was by far my favorite place on the trip so far, and it is the most charming city I have EVER been to. All over this lively city you will find outdoor cafes, theaters, beautiful churches, museums, art galleries, unique shops and welcoming parks and plazas. 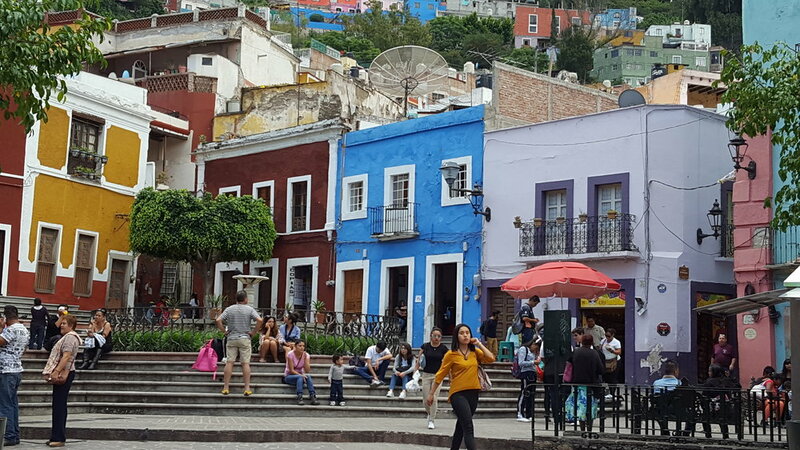 Guanajuato is set into a narrow valley, and colorful houses are squished up the mountain sides. The streets are walkable and clean. Although there is lots of activity in the streets, the ambiance felt unexpectedly quiet and peaceful. It was the strangest thing. Jorge noticed it too. It seems like you can hear the fountains in the plazas, conversations in the restaurants, church bells or the wandering musicians, but you don’t really hear traffic or typical city noises. 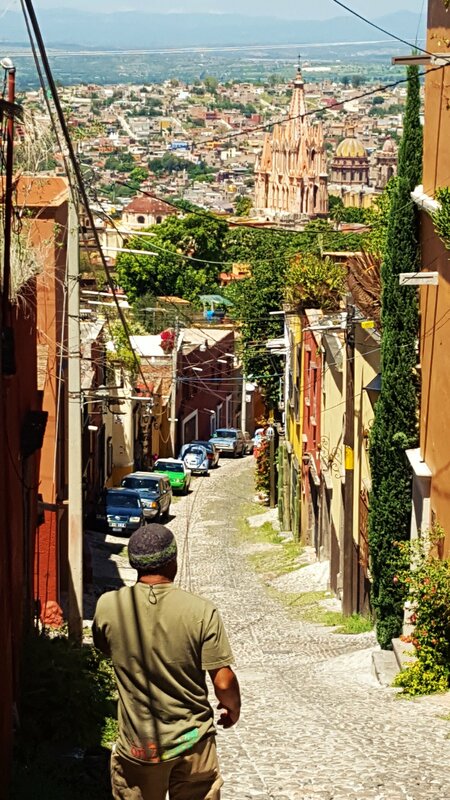 Photos of Guanajuato below. I think the amazing and unique tunnels of Guanajuato contributed to the quiet factor. They efficiently divert, hide and limit the traffic around the city center. The tunnels are an intricate network of roadways underneath the city, allowing you to move easily and quickly to wherever you need to go. I was really captivated by these tunnels, and hadn’t ever seen anything like it. They were quite a sight, with pretty decorative entrances and open stretches revealing the tall rock/brick walls leading up to homes and places of business. I was impressed by the complexity and efficiency of it, especially since they are quite old. In the more narrow tunnels water drips in. It is my understanding that the tunnels are converted underground caverns where the Rio Guanajuato (River) used to flow. The river was rerouted in the mid-20th century. There are even footpaths in all the tunnels, and entrances and exits for both walkers and cars throughout the system. Walkers used stairways leading in and out. Speeding through the tunnels on the Mosquito, exiting into the beautiful city, and racing through the narrow streets and winding steep alley ways made us feel very James Bond. A motorcycle is the perfect transportation in Guanajuato because many roads are too steep and narrow for cars and trucks. 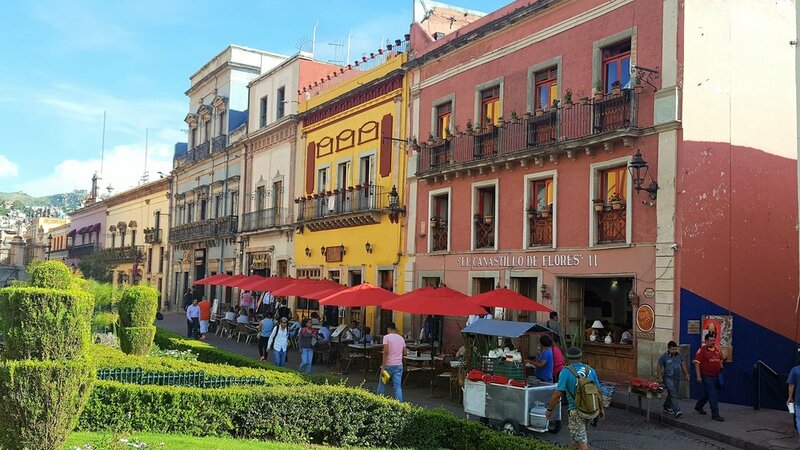 For our side trip to San Miguel de Allende we decided to board PJ for the 3 days we were there. 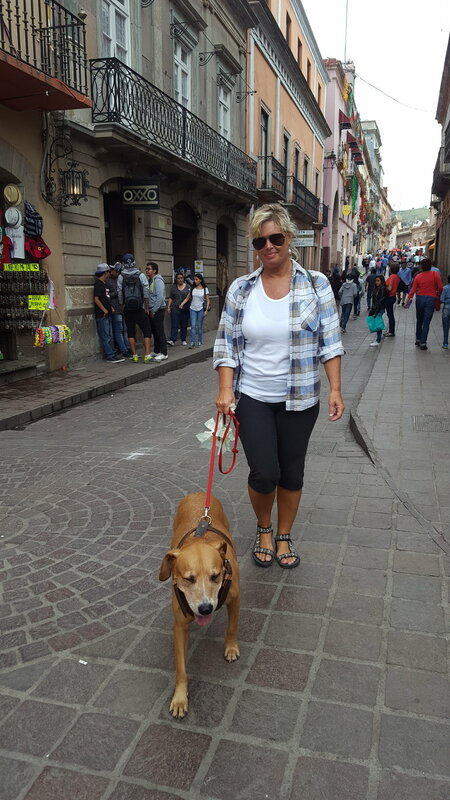 I found the Pet Hotel San Miguel de Allende, which turned out to be an AMAZING place. They charged $10 per day. PJ has been boarded a few times and he doesn’t like it. He also doesn’t like going to the vet. He hates the vet so much that I have to sedate him so he will allow the vet to examine him. The vet gave me some sedation pills to take with me in case I needed them. I usually give him one pill an hour before his vet appointment. I am embarrassed to say I decided it might be a good idea to give him half a pill before taking him to the pet hotel. My thought was that it would calm him just a little, to make it easier. Well, that turned out to be a very bad decision. After giving him half of the pill, he quickly got very lethargic. It scared me, because he had never gotten that lethargic with a whole pill. On the way to San Miguel we stopped to get coffee. As we returned to the truck we saw that PJ had moved to the front passenger seat. He was staring at us through the window with a blank stare. Then he started to waver from side to side, and suddenly he fell face forward into the passenger window. We could see one paw reaching for the window, and the top of his nose facing up. Oh my God, I couldn’t believe his reaction. What had I done? I opened the door gently, so he didn’t fall out. Then I slid into the seat and just sort of held him while he looked up at me with glazed eyes. It was the most terrible feeling. I wasn’t sure why in the world he was so drugged up. I was scared, wondering if he would ever be the same. I thought Jorge might be really upset with me, but thankfully he didn’t make me feel bad. It all worked out in the end. The pill wore off and he went right into the boarding place with no problem at all. 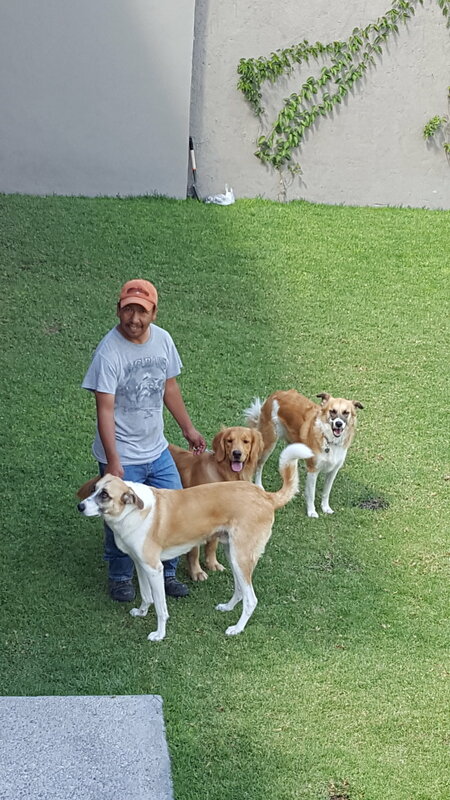 The owner was very professional and knew how to handle all kinds of dogs. I was the problem, not PJ. Later Jorge thought it was funny to remind me of what happened, and threatened to call immigration and have me deported for the incident. I laughed about it, but I didn’t really think it was funny. 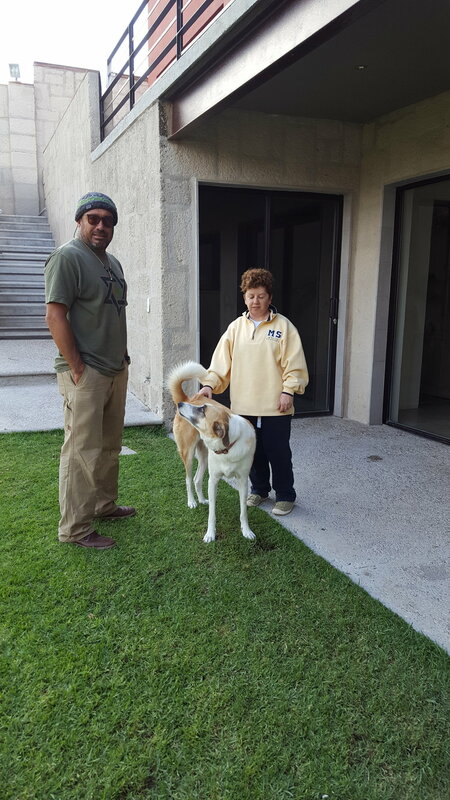 Photos of Pet Hotel San Miguel de Allende below. 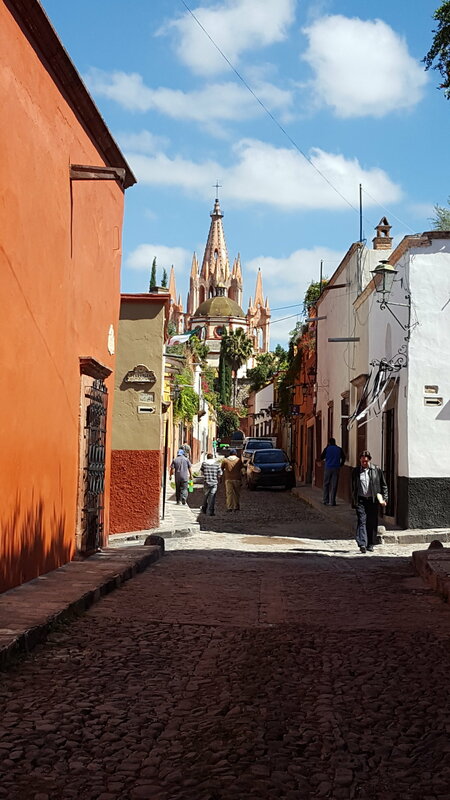 San Miguel de Allende easily takes you in. It's warm and inviting and you are calmed by the colors and the people. I first heard about San Miguel when it was a featured city on the HGTV show, House Hunters International. 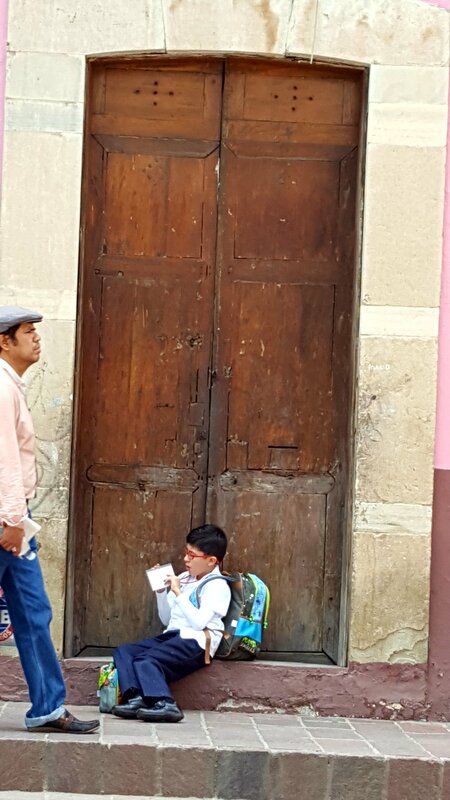 I knew I'd love it, and it was so cool to find myself standing right there on the streets of San Miguel. I have had many moments like that on this trip. Before leaving I would be driving home from work, or trying to fall asleep at night and I would think about specific places I wanted to see. I would research those places, and look at maps, and now I was actually right there. On the first night we took an hour long trolley tour around the city. I like to do this to get the layout of a place, and then return to the places I'm interested in on my own. This particular tour was fun because in addition to pointing out the highlights, the tour guide filled us in on the legends associated with different areas. We did end up returning to many of the places she pointed out. We came back to the public laundry area in the old neighborhood of El Chorro. It's sort of like a plaza area. On the perimeter there are basins in a line with a water trough above them, fed by a spring. This was the traditional public laundry area where the women came to wash clothing. Some people still wash their clothes there at no charge. Below the public laundry is a lovely park called Parque Benito Juarez. This is an active city park for families, people of all ages, birds, dogs, trees and plants. 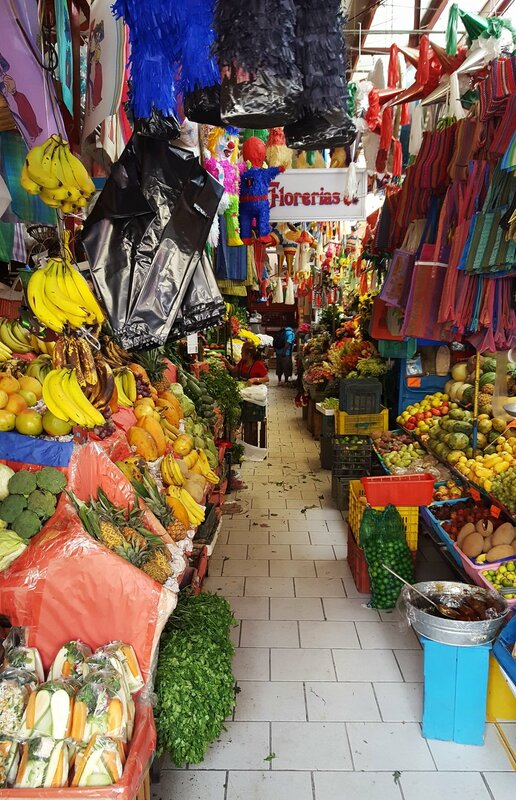 We wandered through their Mercado de Artesanias, which was packed with handicrafts, blankets, hats, jewelry, scarves, purses, and food. We also checked out Fabrica la Aurora, an old converted raw cotton factory. They displayed a diverse selection of art, furniture, textiles, jewelry, home decor and so on. 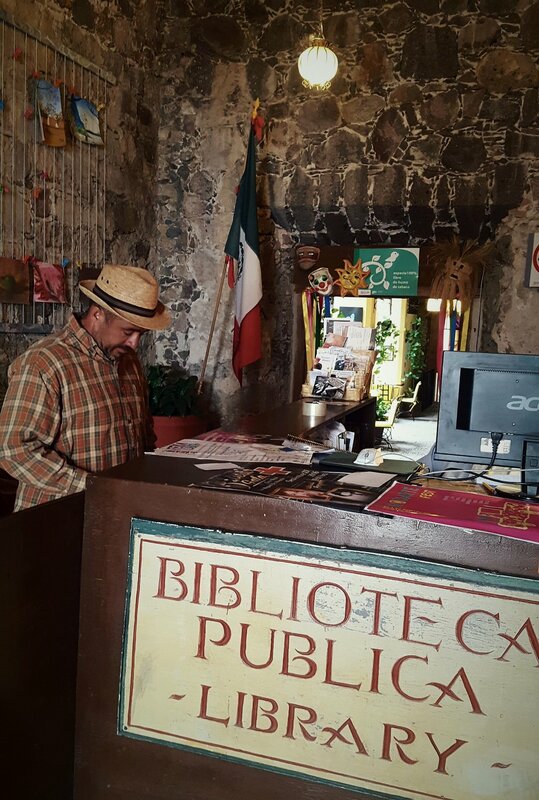 The public library (La Biblioteca de San Miguel) was also a great place to see. They have an old theater in the library, and one night we saw, Miles Ahead, a movie about Miles Davis. 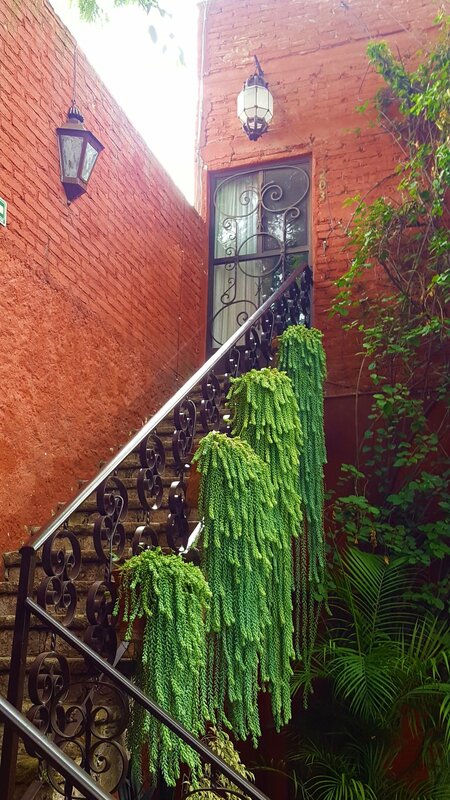 Once you visit San Miguel de Allende, you can see it is an easy place to fall in love with. It is a popular place with Americans, and many call it home. It has a rich history, and is listed as a UNESCO World Heritage Site. From the Colonial and Spanish architecture, to the windy cobblestone streets, the boutique hotels, artsy shops and top of the line restaurants, it is an authentic, sparkling jewel. 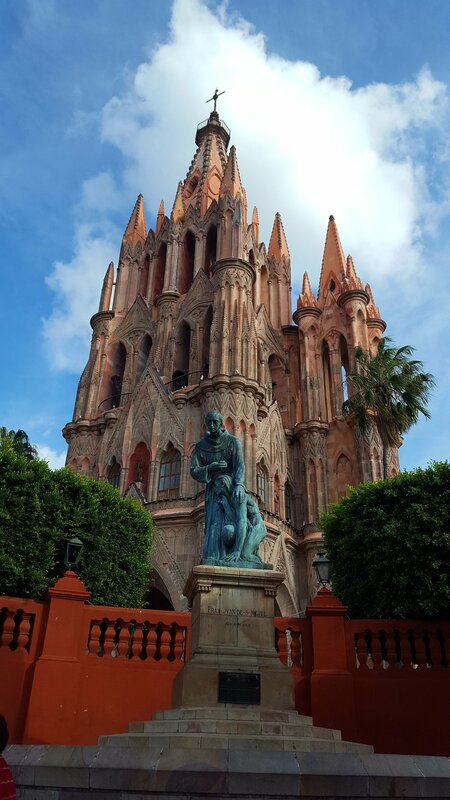 Photos of San Miguel de Allende below. On another night in San Miguel we read there was tango dancing at a cultural center, so we decided to check it out. As we entered the building we ran into an older, elegant woman wearing a….”tango outfit”. She said, “Are you here for tango?” We replied, “yes.” We weren’t sure…was it tango lessons, or just tango dancing?? She said they would teach us, no problem. So we follow her upstairs to a dance room, and there were only 3 older men waiting to dance. Oh boy, this was going to be awkward. I was sort of hoping it be a bunch of people dancing and sweating, and the music would be loud and we could just blend in. 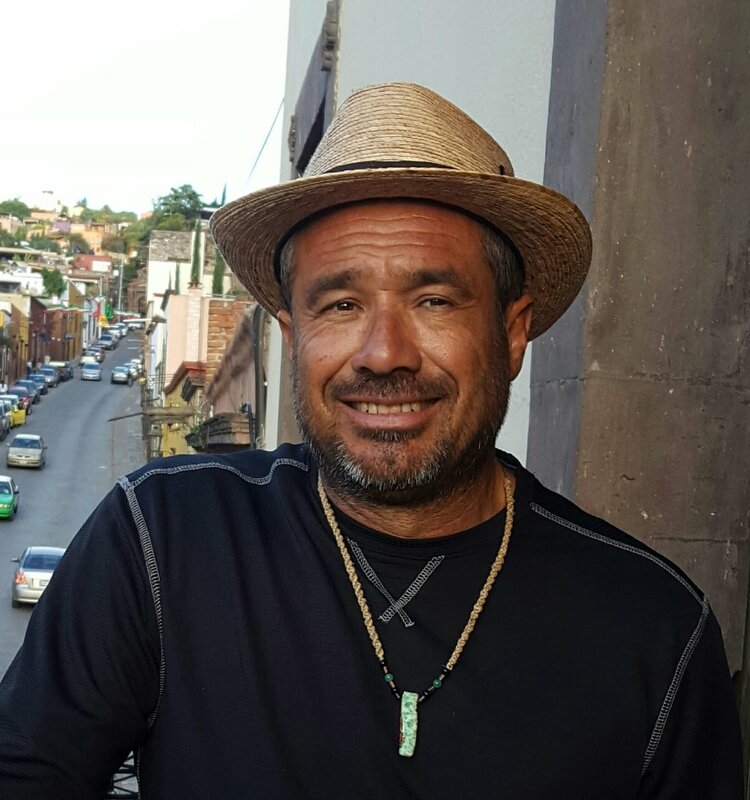 I walked toward the door to put my bag down, and the woman said, “Don’t sneak out!” Jorge whispered to me, “Do you want to get out of this?” He said to meet him downstairs on the street and he would take care of it, which he did. So we wandered down the street to El Jardin, the main plaza. There were lots of people hanging out, and mariachi’s singing in front of one of the restaurants. All of a sudden the sky got dark and the thunder started to rumble and crack. There was a definite storm coming. I told Jorge let’s stay and take some photos of it, with the Cathedral (Parroquia De San Miguel Arcángelh) as a backdrop. Within just a few minutes it got much darker, and rain started to fall. Another minute went by and suddenly it was pouring like I have never seen before. Within about 5-6 minutes it turned into what I thought was a flash flood. The steps around the plaza turned into waterfalls and the water rushed into the street creating a fast river. Jorge and I were amazed by the whole scene and just instantly got excited about it. 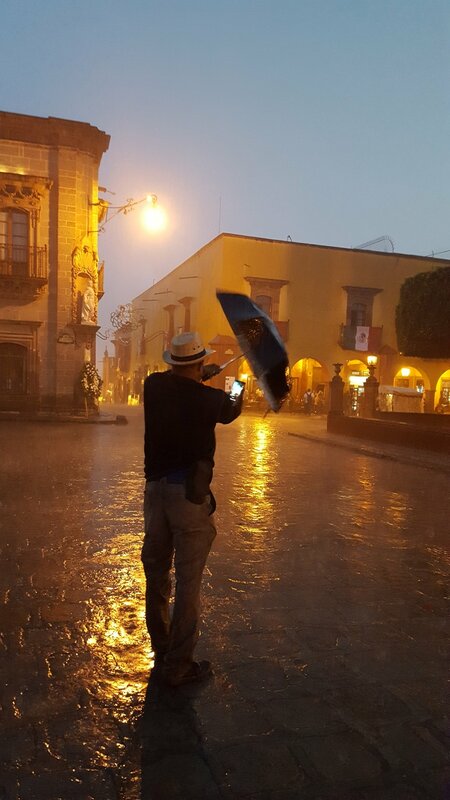 When everyone ran for cover, we ran into the swift waters flowing in the streets, we stood directly under the water spraying from the drainage pipes sticking out of the tops of the buildings, and sat on the plaza steps which was now a newly formed waterfall. We were running around like kids taking video and photos and we got completely soaked. Every item in my backpack was also soaked. It was so much fun. I thought I would like San Miguel more than Guanajuato. As it turned out, I preferred Guanajuato. I liked the bigger city feel, the mysterious, narrow alleys, the art students wandering everywhere, the entrances of unique restaurants and shops and the peaceful parks and plazas. The only thing missing was water. No ocean, no water to swim or kayak. While staying in Guanajuato, we visited El Pípila (statue of local hero of Guanajuato}, the mummy museum (yes, real mummies! ), Cristo Rey (statue of Christ). We hiked up to the lighthouse, and on the trails around our RV Park. We also took a trip to Leon, a town famous for their shoes.